This post has 2,648 views. It’s summer time, which means I have more time on my hands both to work on my research and to have a little fun. The weather hasn’t been the best in the Northeast US of A as we had a more than usual share of thunderstorms and rain, but I managed to go out a few times when I had the chance. I did some hiking at some nearby trails, and also went to Cape Cod for two nights. 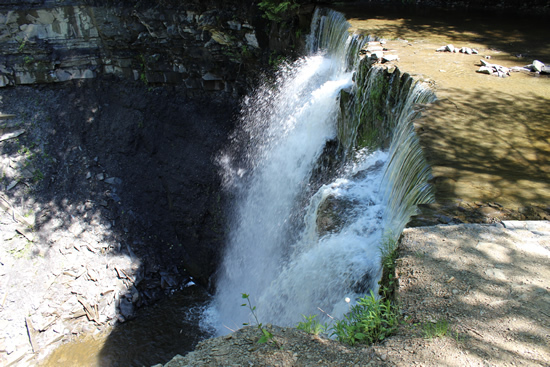 One of the waterfalls at Plotter Kill Nature Preserve. I think this was the upper falls. During the Memorial Day weekend, a friend and I went hiking in the Plotter Kill Nature Preserve, which is located in Schenectady County in Upstate New York. I found out about the preserve when I was searching the internet for nearby hikes with good scenery. The preserve is sizable and we only hiked a small part of it. The place featured a nice forest, a river gorge and some waterfalls for some pretty nice views. The trails lead to the top of the two larger waterfalls, but I was a little disappointed that there were no trails to the bottom of the falls. Some people were able to get down there and take pictures, but they probably had to scramble up and down the steep sides of the gorge which I wasn’t prepared to do. Some of the trails were a bit muddy from rain a day before, but overall it was a nice, refreshing hike. As part of another weekend afternoon trip, a friend and I visited the Secret Caverns. There are two caverns not too far from where I live. The larger and more well-known one is the Howe Caverns (which I probably will visit soon), but on that day we decided to visit the smaller Secret Caverns instead. I never been to an underground cavern before, and it was a worthwhile experience. It was a hot day on the surface, the inside the cave is quite cool. The Secret Caverns isn’t very long or large. In fact, some place are pretty narrow, but this makes me feel like I’m actually exploring a cave. 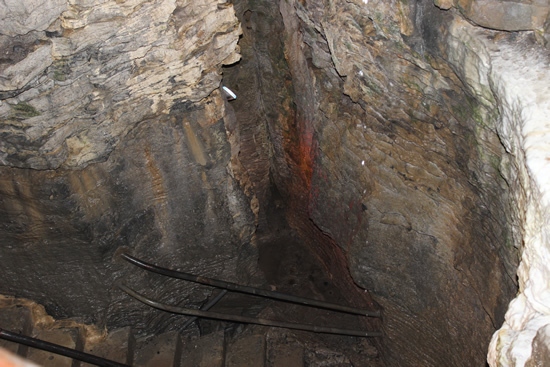 Of course, the tours are guided, the cave is lighted and the ground are mostly flat. Overall, it’s a pretty good place to visit during a road trip or short day trip. The stairs leading down to Secret Caverns. After visiting the Secret Caverns, we hiked Vroman’s Nose, which is a small mountain/hill in Schoharie County. This was an easy hike to top, and the views from the top were quite nice. You get a clear view of the farmland beneath and the other hills nearby. We even saw some small airplanes flying pretty close to us. Lastly, I went to Cape Cod with a friend on a three-day, two-night trip. Cape Cod is known best for its beautiful beaches. It’s a popular summer destination for beach-goers, but we went in early June when it was not very warm and so the beaches were pretty empty. The beaches themselves were still pretty beautiful though, and there are so many of them on the cape. We only took a stroll on two or three. The other highlights of the trip include riding a jet-ski, and visiting Provincetown. Riding the jet-ski was an adrenaline-pumping experience. My friend and I shared one ski, and those things are a hoot. The jet-skis really can go up to about 25 miles per hour which you might not think is that fast, but the open air driving seat and the waves on the sea makes the ride quite thrilling. I was hanging on for dear life trying not to get thrown into the water on some occasions. It’s difficult to steer when the ski goes fast, and when the ski goes fast it jumps up and down on the waves. It was certainly a lot of fun though. A visit to Cape Code couldn’t be complete without visiting the tourist town of Provincetown at the tip of the cape. Unfortunately, it was raining during the day we visited, so we didn’t get to see the vibrant colors of the town that well. We visited the Provincetown Museum and Pilgrim Monument first. Since we paid for the admission, we climbed all the way up to the top of the 252-foot-tall Pilgrim Monument. There was no elevator inside, so it was quite the climb. I’ve been doing more cardio during the summer months so I felt okay, but my friend needed to take a seat once we reached the top. The top observation deck had good views of the whole town and parts of the cape, but it was a little too enclosed. We also went whale-watching at Provincetown, and unfortunately it wasn’t a greatest experience. It’s not the fault of the whale-watch operator, but it was a pretty miserable day with the rain, and to compound on that I forgot to bring motion-sickness medicine and got a little seasick. The good thing is that I didn’t throw up, but I had to stand outside in the cold and wet outer deck to keep myself from throwing up. We also only saw two whales: a small Minke and a larger 10m+ fin whale. I only caught one glance of each though. Next time I go whale-watching, I’ll be sure to take some motion-sickness medicine and go on a nice day. 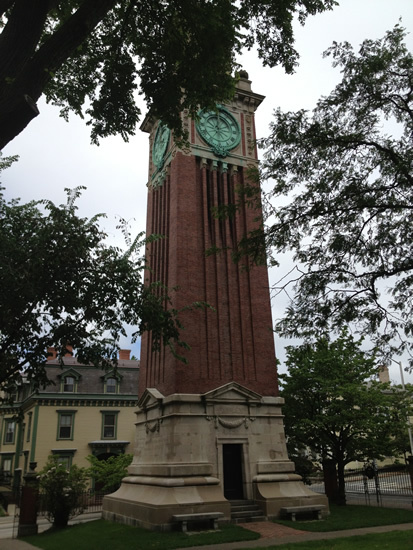 On our way back from Cape Cod we decided to stop by in Providence, Rhode Island to visit Brown University. Brown is the second Ivy League school I’ve visited after Harvard, and it has the similar historical look which I liked. I’d say Brown’s campus is a little more “organized”, while Harvard had a couple of larger landmark buildings. The campus was pretty large, and we didn’t see all of it. We also didn’t have the chance to walk around in the city itself, but it looked pretty nice from the car. I will try to go back there again someday to properly visit the city. So those are my summer outings thus far. I have something lined up for July 4th and following weekend, and after that I’ll be traveling for a conference in a few weeks. In addition I’ll probably go visit nearby parks and hiking trails on weekends if the weather holds up. There is still a lot of summer left to go places.